How do you write an article and do a show about making fire? It might be the most overdone subject in the prepper and survivalist world. I thought about it for a while. Why should I tell you about the fire triangle like you are a boy scout? Instead, I thought I would work through something a little more unique to me. What is 15 Days of Fire? Listen to this broadcast or download “15 Days of Fire” in this player! I love when we get together and practice. The inspiration for 15 days of fire was to give all my readers and listeners, myself included, a reason to get out and practice. My twitter handle is @iamlibertyshow and I would love to see a picture of one or all of your fires. The challenge is to start 15 unique fires with 15 unique methods. Anything is fair game. If you want to use a car battery, blow torch, friction plane, lighter, matches or something you came up with, its all fair game. I encourage you to try for at least 15 in the month of October. This will be a superset of firecraft that will build your confidence in making fire and give you and excuse to improve. See what works for you and what doesn’t. Its also right before the cold of winter starts to move in. I have a survival seedbank from My Patriot Supply for the person who takes this thing to heart. Do something exciting, challenging or just put in the effort on all 15 days, post a picture or two and you will get this seedbank shipped right to your door. 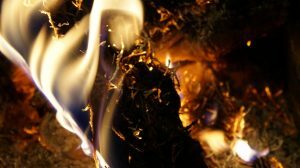 Fire is one of the most time tested, uniquely human, things on the planet. It was most likely responsible for our rise to the top of the food chain. As our technology grew so to did our connection and dependence on fire. Fast forward to 2017 where we have so mastered the art that fire is literally bottled and sold (lighters.) Most of us have decided that outside of matches and lighters there is really no reason to deal with firecraft. This is so sad. When you register that amazing feeling of sitting around a fire at night with people you love it all makes sense. Fire is not just for our benefit. Its a a part of us. This is why our passion “burns” and why love “warms” us. Fire has followed humanity all over history. Its been used for good and pure evil. Its an indifferent force but one that persists. It remains by our side. In 2017 it can be a great mystery but with practice you will master the preparation the creation of fire also known as firecraft. Previous: Previous post: Why Preparedness?